To escape Herod's soldiers, the Virgin Mary and Joseph fled into Egypt with the infant Jesus. Most representations of this story show Mary carrying Jesus in her arms while riding on a donkey, and Joseph leading the animal by the halter. In this drawing, however, an angel helps the Virgin and Child aboard a boat. Joseph is barely visible between the angel and the Virgin. Giovanni Battista Tiepolo interpreted the scene with the nautical expertise of a painter born and raised in Venice. He chose a flat-bottomed vessel not unlike the gondolas that still ply the waters of his native city. The energetically applied washes and the action of the boatman about to push off from the bank convey a sense of urgency. 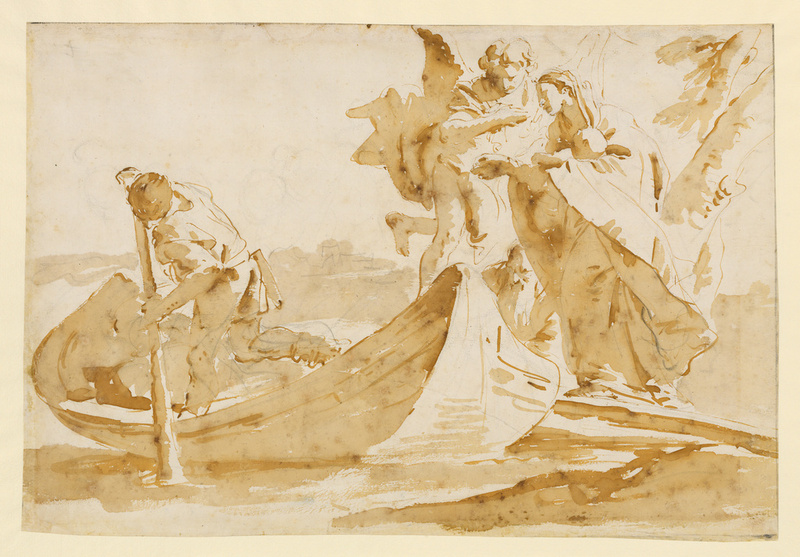 Tiepolo left areas of the paper untouched, creating light and dark contrasts that suggest brilliant sunlight and shadow.